Wednesday, November 22nd: B5, I29, N44 **The Tree Pattern has been won! Only the Menorah & Snowflake Pattern are in play now. Monday, November 27th: O65, O73, O74 **The Menorah Patter has been won! Only the Snowflake Patter is in play. All Bingo patterns have been won! Thanks for playing! We will be holding an assembly of Remembrance on Friday, November 10th at 9:15 am in the school gym. The Cormorant Class will be leading the assembly. 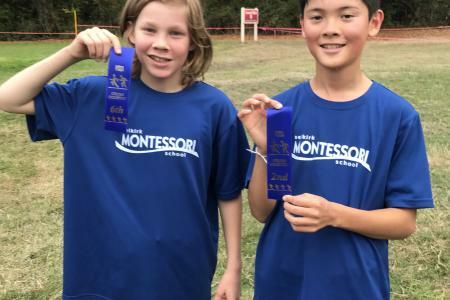 Our cross country running club started in September and has just completed their final competition. Congratuations to coach Angela Sullivan, all our volunteers and, of course, the students, for participating. Keep running, everyone! 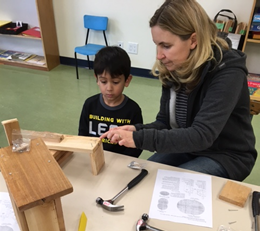 I would like to take this opportunity to thank Vicki Hagel and the staff of the Castle Building Centre for the generous donation of birdhouse kits for Casa’s Kindergarten practical life project. This project expands upon the students’ previous work by moving into more complex three dimensional shapes. Construction will also introduce the concept of building in the proper sequence. When I originally approached Vicki, the co-owner and manager of the Bay St. Castle location, regarding the possibility of donating some lumber for the project, her only questions were: would a design they had on hand work, and, if so, how many birdhouses was I planning to build. In short order, lovely rough cedar fencing material was cut to length, labelled, pre-drilled and packaged with nails and a dowel for the nesting perch. The entrance hole has been cut to suit the preferences of the chestnut-backed chickadee, a native Vancouver Island bird currently listed as threatened by the IUCN. Equipped with a hinged front to enable cleaning, the biggest challenge will be deciding if these birdhouses will be kept as indoor artwork or mounted outside for use. Thank you very much to Vicki and her staff for their generosity in supporting our students’ learning in such a wonderful way! Summer holidays are winding down and at Selkirk Montessori School we are winding up! Floors have been waxed, walls have been painted and carpets have been cleaned. Staff will be back on Monday, August 28th and will start their year off with a full day of professional development. You will be hearing from your classroom teachers soon after -- if you haven't already -- to set up a meeting before school starts. We hope you will be able to take advantage of this opportunity! Every year is a fresh start for your child and there are often changes in them and for them over the summer that we need to hear about. We look forward to welcoming you all back to Selkirk Montessori for the 2017-2018 school year!